In January we mark twelve years of producing Peak Moment Television episodes. 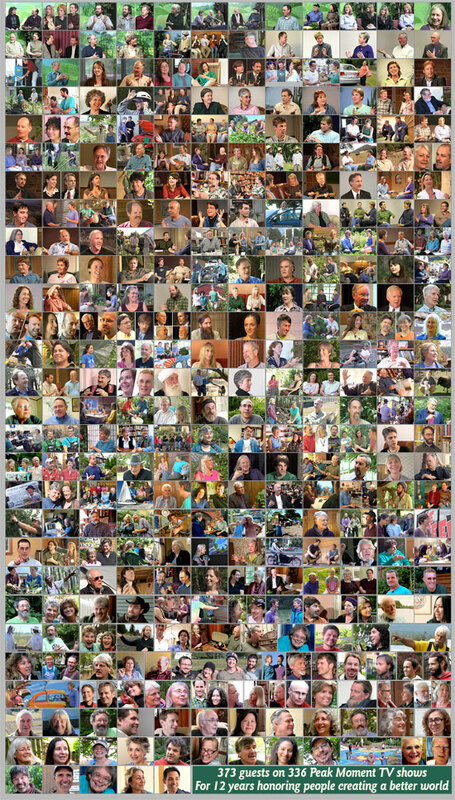 As the picture below shows, we’ve produced 336 episodes with 373 unique guests, the “Peak Moment Stars.” Sometimes our project feels small next to the gigantic needs and losses elsewhere, like the Camp Fire which destroyed the nearby town of Paradise, CA. But we feel privileged to have amplified the voices of many caring and skilled “ordinary” people who are quietly and extraordinarily creating a better world. If your year-end contribution can include Peak Moment Television, we are especially grateful. We will be able to receive tax-deductible contributions online through January 7, 2019, and by mail through February 2019. Our fiscal sponsor is ending this service. We are slowing our production of Peak Moment shows to “occasional”, as we mentioned in our recent newsletter. However, we hope to extend the reach of Peak Moment this coming year through social media. The times seem darker, and the need greater, and recent viewers continue to affirm their value. The Presidio, San Francisco, CA 94129. Write “For Peak Moment” on the check.